Personalised Ice Cream Party Printables now in the shop! Tomfo now has party printables available! 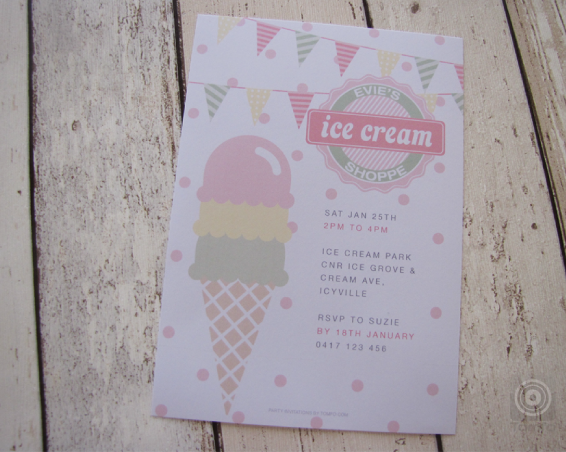 This personalised Ice Cream Party Printable Package was designed for my gorgeous niece, Evie. Mum requested an Ice Cream Shop invite, here is the one we decided on. The party printables can be customised to include your childs name and party details. The invite size is A5 and fits into a C5 envelope. Here are a few close up shots so you can view each piece. FOOD PLACECARDS: There are 4 Food Labels in the package, which come blank for you to write on as required. The colour scheme is soft pinks, yellows and green. The printables can be changed from pink to blue to accommodate a boys party too! This printable is best printed out on 200 gsm card and trimmed with a scalpel or scissors to the trim marks, I usually mark the fold with the point of my scalpel, then turn over the card and softly score the under side, then you have a guide for the folds. CUSTOMISED WATER BOTTLE LABELS: These water bottle labels feature your childs name and have a cute saying on the ingredients side… (Piled high with sweetness, extra sprinkles and a cherry on top. Product of mum and Dad). There is also a space on the other side for each child to have their name written on so you know whose drink belongs to who. Made to fit a 300mL or 600mL water bottle. Print these printables out on normal copy paper and cut out with a scalpel or scissors to the trim marks, then adhere with a glue stick. CUSTOMISED PARTY CIRCLE LABELS: The Personalised party Circle Lables can be used as cupcake toppers (as pictured) or cut out and punch a hole and add some string for a label or tag. To make the party toppers I printed the pdf onto Avery L7256 Stickers, then stuck on either side of a toothpick and inserted into patty cakes as cake toppers. You could also print onto 200gsm card and cut out with scissors, then hole punch and add ribbon as a label. CUSTOMISED FAVOUR CIRCLES: A super cute party favour idea… I used a waffle cone, filled with treats, then used a cellophane party bag and tied with some ribbon. The Personalised Thank you circles were printed out onto Avery L7256 Stickers and stuck to each side of the ribbon to finish. These could be displayed in ice cream holders also. Or simply purchase a noodle box or plain coloured bag and fasten with a sticker as another option. CUSTOMISED BUNTING: The personalised bunting follows the colour theme of the party and comes in 4 colours. Simply print onto 200gsm card, then cut with scalpel or scissors. Hole punch a hole on either side then thread ribbon through. You can print as many as you require. CUSTOMISED MINI CHOCOLATE WRAPPERS: The Chocolate wrappers are perfect for Furry Friends or Choceur Mini Chocolates 15g-40g. Print onto mormal copy paper, then cut to size and wrap around chocolates like a present. Or if you have a chocolate with a silver wrapper, cut to size and make a sleeve for the chocolates, then stick with some tape. CUSTOMISED MINI FLAGS: Personalised mini flags can be used on straws or toothpicks. Print onto normal copy paper and cut to size. TIP: Cut lengthways, then fold in half and glue with a glue stick for best results. Finally once stuck together, cut the “v” shape so it is a perfect finish. You can also take a peek at my ICE CREAM PARTY BOARD for more ideas on Pinterest. I’ve loved designing this party collection, and I’m so looking forward to all that ice cream at the party, you can purchase your own customised version here. Are you planning an Ice Cream Party? There’s 20%off in the shop on my 2014 Tomfo Calendar head to my shop to grab yours so you are organised for back to school!